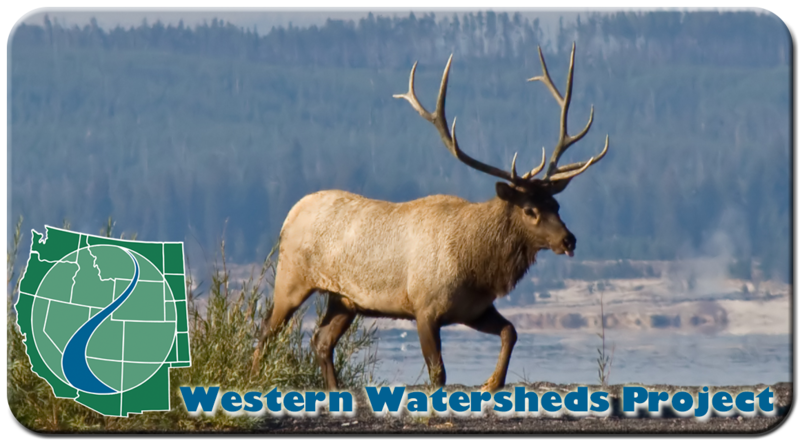 Last week, Western Watersheds Project and our allies with the Sierra Club, Wyoming Wildlife Advocates, and Gallatin Wildlife Association won an important legal victory against a Bridger-Teton National Forest decision authorizing an elk feedground in northwest Wyoming. Unnatural concentrations of elk at Alkali Creek and 22 other feedgrounds around the Yellowstone ecosystem pose a major risk for spreading the always-deadly and highly contagious chronic wasting disease (CWD) throughout the Yellowstone ecosystem. Chronic wasting disease is spreading across Wyoming from its origins in north-central Colorado. The disease is thought to have originated when a herd of domestic sheep, infected with a similar prion that causes the spongiform encephalopathy disease known as ‘scrapie,’ passed the disease to a captive herd of elk in an experimental facility. The Wyoming Game and Fish Department runs most of the feedgrounds in an effort to keep elk away from their natural winter ranges, many of which have been converted to private ranchlands where ranchers seek to prevent elk from competing for forage with their cattle. Wyoming Game and Fish now admits that the spread of chronic wasting disease is a serious threat, and that its elk feedgrounds pose a real risk, but so far is resisting calls from conservationists and the Montana legislature to disband them. WWP believes that because feedgrounds are unnatural and pose extreme risk of amplifying chronic wasting disease, putting the large elk populations in Jackson Hole and Yellowstone National Park at risk, they should be eliminated. Elk would then spread out across the landscape in wintertime, re-occupying their original winter ranges. In addition, state and federal agencies should foster the expansion of native predators like wolves, coyotes, and mountain lions, because they are the best (and only) tools to cut the chronic wasting disease out of the herd. Our case was bolstered by amicus briefs from scientists, local businesses with an interest in maintaining abundant elk, and Montana lawmakers, all of whom agreed that elk feedgrounds pose a major risk to cause or accelerate disease outbreaks that could threaten to decimate the herds of elk in Jackson Hole and Yellowstone National Park. A special thanks to the public interest law firm Meyer Glitzenstein & Eubanks LLP, which represented us in this great legal victory!